This article has been updated to reflect actions at the meeting. The meeting began with farewells to two senior members of the Metrolinx team. Jack Collins, the Chief Capital Officer, is retiring to return to live with his family in northern California. He is one of the “straight shooters” at Metrolinx from whom I never had any sense of “spin” in his presentation of information about his projects. His knowledge of actually building transit projects, and LRT in particular, has been a valuable part of Metrolinx work. Stephen Smith, a Board Member and Vice-Chair, leaves after spending 10 years at GO Transit and then Metrolinx. The Board spent only a short time in debate on this matter, and never really addressed the fact that the tariff does not line up with the claimed formula for calculation of fares (see Sean Marshall’s article on this linked below). For the second and third tier of fares, the increase ranges from about 6% to 7.5%. For the top tier, the increase is about 7.3% for the low end of the range. However, riders on the outer ends of lines fare considerably better. 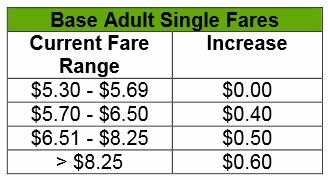 The Kitchener single fare is now $16.60, and it will rise to $17.20, a bump of only 3.6%. The problem with GO’s formula is that fares go up the most for medium distance travellers, while those riding furthest have the smallest percentage increase. It should be trivial to adjust the two factors (Base and Rate) and recalculate the entire fare table. However as Sean Marshall has demonstrated, the existing fares don’t actually work that way. The tiered increases GO actually uses are a rough attempt at this, but they are biased in favour of long-haul riders. If the Metrolinx Board were doing its job, it would spot this problem and demand a program to move to a justifiable, formula based tariff possibly over a multi-year implementation to smooth out the effects.